For the past few weekends, I became a bit anti-social as I've been turning down invites from Paul and friends to go out and check out the city. I would, in fact, declare that all I want to do is to stay at home the whole day. What have I been up to? You probably might ask. It all began one day as I was browsing through Groupon Singapore's page. A certain ad showing a photobook deal caught my eye. I've been wanting to organize our photos for years and putting them in a neat and pretty photobook just made perfect sense. So there, I bought a couple of coupons worth $20 which is good for (1) 40-page photobook each (retails at S$91). I have to admit that starting a photobook wasn't easy. I had to navigate myself around the website and test out some templates before I finally found the out. The initial plan was to have one album per country visited but I eventually decided to lump all our 2010-2012 travels together to make it look like a volume. The other photobook then was dedicated to our one and only niece, Julia who has a lot of photo taken by her aku Paul. 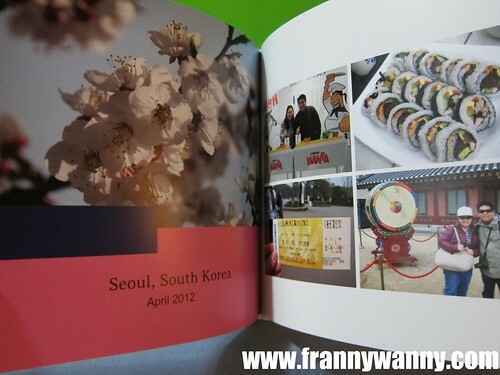 The deal was from Photobook Singapore and they actually have several options on how you'd like to create your book. There's the option to create from scratch (an empty book), to use the Photobook Designer and lastly to use one of their many templates. I'm not very creative so I went for the last option so that I won't have to worry about adding some stickers or to change the layout for certain pages too. The only drawback is the lag time. Since it's a web-based program, it takes a while for the elements to load and there are moments wherein the whole thing would just freeze. Thus, it became a habit to save after every page. I think the option to download the Photobook Designer might be a better idea but since I was a photobook newbie, I went for the online option first. The second book that I did took a bit more time. Over two weekends, I put together close to a hundred photos that Paul and I had as we traveled the globe starting with our honeymoon back in 2010. How cool that we have been to quite a number of countries and this just made us excited for the trips that we'll be taking in the coming months and years. With my very novice knowledge, I learned to enhance photos, brighten a couple of ones and added borders and effects to some. As soon as my projects were done, I hit the "Order Now" button which directed me to short form where I filled up all my details as well as the Groupon voucher codes too. I love how everything was just so organized! After paying an additional S$8 per book for express shipping, I got them exactly 4 working days after. In fact, I was also issued with a tracking code first to check the printing process and later on a DHL tracking code to know when will my books be delivered. Photobooking is such a fun experience and I will definitely make more in the future. Check out Photobook Singapore at http://www.photobooksingapore.com/. Photobooking..that looks really cool. :D Bagay talaga sa mahilig mag-travel.